The CNN report below should make people in this country realize that true freedom speech and the right to vote should never be taken lightly. In this shocking report, a man is beaten by men carrying batons, four Iranian riot policemen and members of the Baseej. The beating took place because he tried to protect a 14 year old girl who was shoved by these men. If you protest at all, you can face the rath of these terrorist police types. The election was most likely fixed, as there was no international or outside supervision of the vote counting. Mr Hossein Moussavi who ran against Ahmadinejad really had no chance to win. The government most likely suppressed a good majority of his vote, so that Moussavi would loose. Regardless of who would win, the challenge for President Obama now is to keep Iran away from nuclear weapons, and to convince the government to protect the people, and rid themselves of the ruthless government factions like the Iranian riot policemen who are taking advantage of the civilians of Iran. TEHRAN, Iran (CNN) -- He was surrounded and pleading for them to stop but six men with clubs, batons and metal rods kept battering a young Iranian man with ruthless force. The swing that keeps replaying in my head was the black baton that smashed the man in the skull behind his left ear. 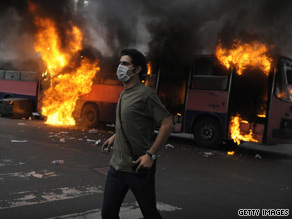 An eyewitness says the hatred is palpable on both sides in the streets of Tehran. Seconds earlier the man had dared to stand up to the baton wielding men because they had shoved a 14-year-old girl. For his chivalry he got one of the most savage beatings I have ever seen at the hands of four Iranian riot policemen and members of the Baseej, Iran's plain clothed volunteer militia. "To hell with Iran," he said as he sat beaten and battered along the sidewalk. "This is not my government. This is not my country." A grown man who watched the beating burst into tears. This was a glimpse of the ugly aftermath of Iran's presidential elections, which sparked outrage among supporters of candidate Mir Hossein Moussavi. Moussavi's backers are calling President Mahmoud Ahmadinejad's landslide victory a sham. They're demanding the vote be annulled. The government's response has been a ruthless and violent crackdown. For eight chaotic hours I saw the two sides clash throughout the streets of Tehran. These were Iranians versus Iranians, but the two sides were worlds apart in appearance, ideology and brute force. Moussavi's supporters were mostly young 20-something men and women. They were college students, young professionals with degrees demanding social freedom, a better way of life, and better relations with the West. Two teenage girls carrying bricks had French manicured fingernails and designer sunglasses. The protesters threw objects, burned trash bins, honked their horns and chanted "death to the dictator!" They were loud, until they heard the roar of the motorcycles. The motorcycles belonged to two groups of Ahmadinejad supporters: Iran's riot police and the Baseej. The riot police looked like modern gladiators, muscular and menacing with camouflaged uniforms, black boots, black bulletproof vests and black shielded helmets. They rode in pairs. One drove while the other wielded a club or a baton. They swarmed crowds of rowdy protesters in packs of about 20, beating anyone who got in their way. On several occasions I saw female Moussavi supporters plead with their male counterparts not to run away. But they almost always did. They were clearly intimidated by the brutal show of force. The Baseejis were just as ruthless. Those who didn't ride on motorcycles walked the streets in large packs carrying clubs. They didn't wear uniforms, so they could easily ambush protesters. They beat one protester so badly that he collapsed in the middle of an intersection and trembled uncontrollably. I saw one battered young man crawl into the lobby of an apartment building, curl up under the stairwell and sob. He had welts on his forehead and bruises up and down his arms. "They hit me with everything," he said as he gasped for air. "They hit with clubs. They hit me with chains." When the two sides weren't throwing objects at one another, they were hurling insults. I heard and felt the hatred on both sides. During a Saturday afternoon news conference Ahmadinejad compared the violent crackdown against the protesters to a citation after a traffic ticket. A few hours later thousands gathered in midtown Tehran to hear Ahmadinejad deliver a victory speech. The re-elected president said the elections belonged to Iran's people. Never since the Islamic Revolution of 1979 have Iran's people appeared this divided.